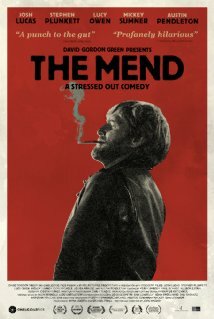 Movie Review: Although “The Mend” weaves a few laughable predicaments, I wouldn’t properly call it a comedy. John Magary’s independent debut feature is a vicious, punishing, and scathing study of characters, starring Josh Lucas and Stephen Plunkett as two dysfunctional brothers who simultaneously live in a devouring emotional crisis that leads to self-degradation and existential chaos. Mat (Lucas) and Alan (Plunkett) are suffering from the same ailment - emotional instability - but react in very different ways. The former is lax, unpredictable, and totally carefree (almost self-destructive), spending most of his time wandering the streets of New York, whereas the latter seems unaffected at a first glance, keeping his anger and frustration in an invisible inner level, but despite acting adequately and having a steady job as a legal aid lawyer, he’s prone to easily degenerate in the face of a problem. Instability is not the only point they have in common: both have girlfriends who love them, and they both hold a grudge against their absent father who was diagnosed with Parkinson. On the day before their vacation trip to Quebec, Alan and his girlfriend, Farrah (Mickey Sumner), are giving a small party in their cozy apartment in Harlem when they spot the intruder Mat among the guests. Mat, who apparently broke up with his girlfriend, Andrea (Lucy Owen) and her son after an argument, plans to stay in the apartment while his brother is away, and soon the place is turned into a complete mess. When bedbugs invade Mat’s girlfriend’s apartment, he invites her to the house exactly when Alan unexpectedly arrives from his vacations alone. Devastated and numbed, the latter will admit later that Farrah left him, and now he feels completely adrift. The filmmaking style of Mr. Magary resembles the enthralling realism of the Safdie brothers, boosted by Judd Greenstein and Michi Wiancko’s intriguingly suggestive score, strong dialogues, and the compelling performances from the four main characters. Nevertheless, the film isn’t flawless, occasionally abandoning the required straightforwardness to become diffuse, uneven, and overextended. I had the sensation that the insanity and disorder grow a bit out of proportion in a few crucial scenes.